As a weekly, core event mini-series, there is a LOT that happens in this book. Also, though this is the first issue of the series, it was numbered as 4–because we’re counting down TO Zero Hour, and go from #4, to #3, down to #0. This was my first DC Universe event that I got in on from the very beginning. While I count Eclipso: The Darkness Within and Bloodlines as events, those played out in Annuals and thus were a separate thing from the actual titles. Zero Hour played out across actual issues of a bunch of different series throughout July 1994, and was truly an Event, capital-E.
We open on the Time Trapper being killed. Knowing the end of this story and 20+ years of DC history since, it makes total sense who the villain of the piece is from these pages, though I recall being entirely clueless at the time. We then jump around quite a bit as pieces are moved into place, both for this core series and to set things up for tie tie-in titles for the first week of the event. Metron finds Darkseid and urges him to act. When that fails, he leaves on his own to seek allies elsewhere. Meanwhile, the Joker finds himself facing Batgirl, and then an equally-surprised Batman and Robin who don’t know who this young woman is. The Linear men become aware of a disturbance in Time, so Waverider and Hunter (with no reference at all to Sum: Zero–the Prelude to Zero Hour from Showcase ’94 #s 8-9) are dispatched to investigate. They arrive in the far future just in time to see The Flash–Wally West–die trying to shut down the rift eating through Time itself…they escape into the past. Back in the present, Superman meets up with Batman for the first time since before their respective “big events” (Superman’s death/return and Batman’s broken back/healing)…just as Metron shows up. Waverider and Hunter then encounter a young Hal Jordan, himself displaced in time, and try once again to stop the rift, but this time only Waverider gets out, though Hunter is able to tell him to look up a “crisis.” Back on Earth in the present, Hawkman confronts Vandal Savage, and then splits into numerous iterations of himself, confusing Savage. Metron and Superman locate Kyle Rayner, the current Green Lantern, and broadcast a message to the heroes of Earth, informing them of the situation. Metron then confronts the Spectre; Hawkman re-merges with himself as the Justice Society shows up; Vandal Savage disappears, and Waverider appears, bearing the horrible news of this crisis having already claimed its Flash…and Extant gloats. Given its relative quick point, I’ll touch on the art, first. It’s Jurgens…with Ordway. Fantastic stuff, some of my absolute favorite, particularly given their involvement with the Superman books, this was a line-wide event, but helmed by “the Superman guys” I was already familiar with, AND Superman’s involved, so when this came out, it seemed a natural extension–or expansion–for me, and fit perfectly. Even now in 2016, I love the art, and it just IS. This being my first such event, and these guys on the art, their work became instantly “iconic” for me, and a standard I often hold stuff to even after another 22 years. Story-wise, this also fit into the Superman books of the time–my core anchor to the then-DC Universe. His involvement here brought me into it (Ditto Waverider), and though at the time I wasn’t all that familiar with many characters, there were enough that I WAS familiar with that it never turned me off. I understood–even then–that this was bringing together a ton of different characters, so I followed along, getting more out of the characters I knew, and rolling with those I did not. Some of the scenes that unfold in this book remain iconic to me both in the visuals as well as story beats–particularly the Flash’s big moment. We get just enough in this issue itself to grasp the core of what’s going on–rifts in Time are eating backward from the End of Time as well as the Beginning, causing anything from those periods to cease to exist, both ends moving toward the late 20th century. We see characters experiencing chronal anomalies, as everyone is affected from humans to gods and everyone in between. This issue virtually ignores the prelude bits from Showcase ’94, without even a reference or footnote pointing readers to it, so I certainly didn’t miss it back then, though it gives context for the panel Extant appears in here. 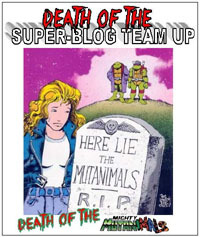 Other than that, we’re introduced to the situation, see how it’s affecting things, see various characters face the situation while others notice its effects, a call to action goes out, and though this issue alone provides a lot of story, it also shows us glimpses of things that are expanded on in various tie-in issues. I only remember reading several of the Batman and of course the Superman tie-ins, and this core series and getting plenty from the Event. This time through, I’m reading every tie-in that I’m aware of, hopefully lined up with the weeks they were originally released in (corresponding to the core mini’s issues). The core series was a 5-issue WEEKLY book…with the entire event, start to finish (outside of the prelude) taking place in ONE MONTH. Blink, and you miss it. Blink twice, and you missed the Zero Month as well. Drastically unlike modern events that can take six or more months to a year to play out, chewing up entire ARCS in a title or filling entire mini-series if characters’ involvement can’t interrupt something in their individual titles. 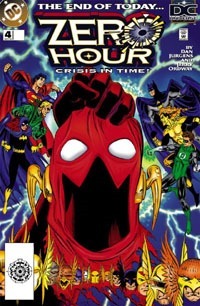 Zero Hour, then a bunch of #0 issues for Zero Month, then the DC Universe continued on. That I’m about to dive into all of the tie-ins along with the core series and Superman/Batman books is something I’ve wanted to do for a long time. And as a self-proclaimed Official Reading Project, I’ll be sharing my experience in writing, as I intend to cover every issue (including the Booster Gold issue from Geoff Johns). Well…that’s grim. And a bit disappointing. 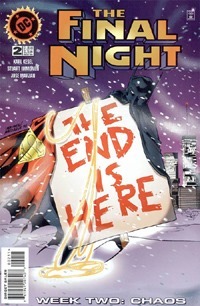 This is the third issue of four under the Final Night title, though there are numerous tie-in issues. 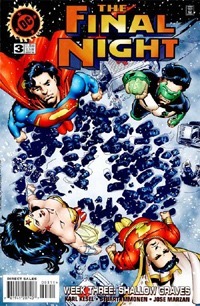 And yet, this issue–The Final Night #3–is continued in something else: a special, Parallax: Emerald Night #1 that was apparently on sale simultaneously with this issue. As things worsen for Earth–the sun-eater’s drawing heat and energy from the sun but not its actual mass–Luthor (with a tip from Ted Knight) realizes that means the sun will soon go nova–incinerating all life in the system, and certainly on Earth. Amidst this, we see Warrior (Guy Gardner) and new hero Ferro getting help for a badly-injured Wildcat, and the Phantom Stranger gives Dusk a tour of humanity, showing sides other than the mob that had attacked and blamed the crisis on her. Etrigan–The Demon–proposes a bargain with humanity, that he and his kind will save the Earth, if a unanimous decision is made to embrace hell; while the Spectre protects Gaia, and Zatanna and Fire save Ray. Not stopping there, the two then enlist Firestorm to bring momentary light to the village, while Jade and Obsidian reunite with Sentinel and Superman visits his parents. Back at Warrior’s, Guy laments what things are and used to be, and then glimpses something Green. And that “cliffhanger” leads us into the Parallax issue. Story-wise, this issue seemed a bit more packed, and while I’ve figured stuff with The Ray would play out in his own series (thinking his series was still going on at this time), it seems that it’s been something to play out in this core series instead. I appreciate touches like the Phantom Stranger showing up and helping Dusk to see other sides of humanity–not just the bad–even though it’s a rather cliché thing. It also reminds me that the character exists and was used like this in events of this sort. Similarly, we see the Spectre acting on a global scale while remaining apart from things going on…a difficult character to handle by its nature in the face of something like this. The art team does a good job, and everything is gotten across pretty well…I have no real complaints visually. This third issue pushes things into dark territory, as things are looking impossible for the Earth and its heroes. The sun is being consumed, and where the Earth faced being frozen, now it faces incineration…neither condition supports life beyond a few more hours. Even Superman is at a loss–deriving his power from the sun, he’s virtually “normal” at this point, denied the sun’s energy himself. I’m convinced that Dusk does play a role in the end of this story…there’s been enough done with the character (superficial as that’s been) that it would seem a waste to not have something planned. I’m less than thrilled at the realization that there’s the direct continuation into a side issue: while I know full well there are numerous tie-ins, numerous details going on outside this core story that are relevant to the story–thus far the core mini has technically only continued directly into itself. My satisfaction at scoring all 4 issues for $1 is diminished now, realizing that I missed the fifth issue that would make more sense to have now. Of course, I have read that issue (though I don’t recall much detail consciously) but it would be much more satisfying to read it now and not have to go on memories from several years in the past. For 25 cents, this was a good issue, reading in context of the mini-series as a whole, and I’ll be diving into the fourth issue shortly. We open on a page of exposition via a news story to bring us up to speed on the current situation, leading into the new stuff for the issue. Lex Luthor turns himself in by way of offering his genius to help overcome the current crisis. Around the world, heroes do what they can for the general populace, assisting where their powers and abilities allow them, overcoming challenges to conventional services–such as fire trucks being unable to get to fires due to gridlock. Implementing a design from Luthor and modified by Brainiac 5, Green Lantern Kyle Rayner gets a probe into what remains of the sun, gaining valuable data. Meanwhile, the Ray and Dusk come face to face with ground-level reactions to the crisis, and we see new figures emerge. While my initial reaction to Immonen‘s art with the previous issue was less than stellar, moving into a second issue of the art, building from that first, I found it more appealing here, perhaps for a bit of “normalization” of a growing context and expectation of it. The visuals continue to be solid, and I really was not taken out of the story by any weird/odd art…and I’ve noticed as well that despite being a “core event mini-series,” this has been seriously lacking in full/double-page shots despite the enormity of stuff going on…and that is a great thing, to me! 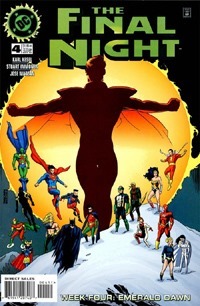 We get a full-page image at the beginning, emphasizing the major moment of Luthor and Superman (which also serves as a credits page), and then we get a full page at the end for the “cliffhanger.” Even something as huge as Kyle Rayner descending into the Sun/being in outer space does not get itself a solo full-page. Which basically means there’s more room for story, for moments, to get development, without stuff being padded out. The same applies to the story itself–there’s simply more content TO the issue for not falling back on several pages of little to no words and just massive imagery. We get bits with the various heroes, their interactions with each other and the world, as well as what I take to be “hints” of stuff sure to be expanded on in relevant tie-in issues. I don’t think I was ever consciously aware (and even if I was, I would not have been able to tell you so prior to this reading) that Kesel had headed up a DC event like this. I like that despite the larger role of “the trinity” we also have involvement from other heroes, and that this isn’t “just” a Batman/Superman/Wonder Woman thing with near-useless cameos of other characters. 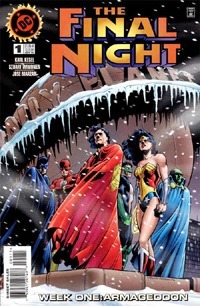 As with the first issue, this is very much part of something larger–firstly in itself as only the second issue of a four-issue series, as well as serving as a generalized narrative impacting the bulk of the DC Universe of its time of publication. So this definitely does not stand alone (where one could sample the first issue and go from there, this isn’t even that) so there’s really no context-less point to get this issue by itself. If you’re interested in the entire mini or event, and it’s one you’re missing, it’s certainly worthwhile, but I suspect as a lone single issue one would be far more satisfied simply reading some other title’s tie-in issue to the event. For my part, having acquired the entire mini in the same week for 25 cents an issue, I’m thoroughly enjoying the chance to read this, and find myself eager to acquire the tie-ins and get to read those as well. I’m quite sure I’ve read this before…but I’ll be darned if I can remember it. This actually felt like I was reading it for the first time. Knowing I’ve bought the entire series at least once before in bargain bins or as a cheap set, I can’t imagine I didn’t read it…though that’s entirely possible. I know I’d read the Superman tie-ins, as events from this led to the electric-Superman saga. This issue sees an alien arrive on early, bearing grave news: an entity that consumes all heat/energy is approaching Earth’s solar system and will destroy the sun, and in turn rendering Earth a lifeless iceball. The heroes–around Superman–gather, and launch a two-pronged plan to repel or distract the sun-eater…but this wouldn’t be the start of an event if things worked out right away, would it? The heroes’ plan fails, and Earth is left in darkness…a final night from which nothing will survive more than a few days. I can’t say I’m overly enthused at the art. I should like it–I usually enjoy Immonen‘s work–but there’s something a bit "off" about it here. Perhaps it’s reading this out of context, or expecting something different, or just seeing a number of no-longer-currently-familiar characters that doesn’t quite do it for me. The art is hardly bad…it’s just not what I "expected" or thought I remembered. Still, we have numerous characters and multiple super-teams represented in this issue, and things move pretty quickly from introduction to action to result in what I would (by contemporary standards) consider an "ultra-compressed" story. The writing is good, solid stuff, and certainly makes sense for what’s going on. We have the introduction of a massive threat, a gathering of heroes and plan to confront it, the execution of the plan, and the result. Given this event is one month long, and its core is this 4-issue mini-series while more generalized action plays out in other titles, I am ok with the lack of detail to stuff here in favor of moving "core events" along. It also has me very interested in reading the various tie-in titles to see far more detail to the unfolding crisis. While it certainly benefits by way of 1990s comics being so cheap these days, this is also the sort of "event" I would love to have today in 2016: instead of having to invest in 3, 4, maybe 6 issues of every single tie-in title as well as an event mini-series or few, the event plays out in a single mini-series as well as just one issue of any given title tying in. I almost wish I’d held off on reading this issue, solely for the fact that I’m ready to dive into the rest of the mini, yet have no idea when I’d actually get around to hunting down all the tie-ins to the event. I snagged 3 of the 4 issues from one set of quarter bins, and the missing issue from another at a different shop a day later–so I have the benefit of scoring the entire mini for $1 total without putting any particular effort into getting it. As such, this issue is very much worthwhile to me FOR my twenty-five cents, as I can move straight into the rest of the series without waiting. However, I do suspect that taken as a singular issue completely apart from issues 2-4, this wouldn’t be all that great an issue in and of itself. I enjoyed the reading, and look forward to the unfolding story, and continue to dig in on this run through fun back issues and nostalgia. One up-front problem with reading this issue now: I know who Monarch is…who he was supposed to be…and how stuff’s developed over the quarter-century since this issue was published. So there’s no true wondering, curiosity, nor concern to me about that…nor does this issue hold any particular story/continuity significance to me outside of being the introduction of Waverider. Which–honestly–is the reason I picked it up this time around. I wanted to revisit that character’s introduction, given the name appears only as homage in the current DC’s Legends of Tomorrow tv series. The issue opens on someone being saved by a hero pulling him out of some rubble…though he doesn’t seem to remember which one…it could be any of a number of heroes active in the late 20th century (1991). We then move to the year 2030 (when this issue was published, that was nearly 40 years in the future. Now…it’s a mere 14 years!). Matthew Ryder is a scientist, working for the government…which itself is under this Monarch–a super powered being who rules over all, providing order and peace. Or as Ryder sees it…”order” and “peace.” Though he has a family, he sees even family time as a mere intersection of four lives drifting apart from each other. At work, one day, there’s a breakthrough, and time travel becomes a reality…at least to some degree. Ryder volunteers to be a test-subject, but is turned down: he simply won’t conform and blend with society. One way we see this is with his visiting a small shop for black market disks on turn of the century history (REAL history, not the stuff force-fed from the top-down). Events come to a head and Ryder stakes his life on a risky endeavor that brings him to the attention of Monarch…and ultimately “earns” his place in the time travel testing. Ultimately, this leads to his rebirth as an energy-being with temporal abilities–at a touch, he can see one’s most probable future. This is an ability he plans to put to use to try to determine which of “the heroes” becomes Monarch…as Matthew Ryder (now Waverider) seeks to change the future. As said above–I already know the resolution to “who is Monarch?” so there’s no particular significance/drama there for me personally. Though I’ve also read this very issue at least once in the past, I didn’t remember much detail, so in many ways this felt like a first reading for me. The issue also felt a bit dated with its technology references that are now 25 years old. I’d forgotten that this entire issue was basically “the origin of Waverider,” to give us background on who he was, how he came to be, the time-travel stuff, the Monarch question…basically to set the character to then move through the various Annuals with a lot more context than could reasonably be set up a dozen times. The story in no way blows me away–it’s ho-hum in that regard–BUT it is absolutely not bad, either. It failed to excite me now, 25 years after its publication, some 24 1/2 years after its story was fully wrapped up…but as a piece of its time, it worked. Visually, I quite enjoyed the issue…which did not surprise me, given the Jurgens art, and having so thoroughly enjoyed his work on Superman in the ’90s. 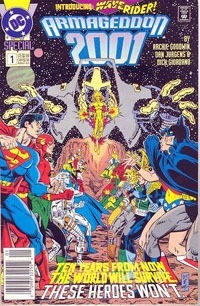 With most of my ‘experience’ with Waverider and the Linear Men coming from the pages of Superman and Zero Hour (art by Jurgens on both titles) and the Superman/Doomsday Hunter/Prey mini (again, Jurgens art), character designs and such in this issue felt extremely familiar in a good way, lending to a visual continuity I always enjoy. As best I can recall at this typing, my earliest exposures to Waverider were the Adventures of Superman Annual that took part in the Armageddon 2001 story as well as the 2nd/bookend issue to the event Armageddon 2001 #2. Those were followed by his appearance in the Legacy of Superman special and then certainly Zero Hour. He also appeared in an issue of Superman shortly before the Doomsday! story, but I missed that and I recall the issue being a hassle to acquire. Which all gets back to: I don’t recall much “fallout” from this series outside of it having obvious effect on another title of the time and the way elements were picked up (yet again: by Jurgens) for Zero Hour, or Waverider’s place in the DC Universe for a few years. I know there were a couple of follow-up mini-series, but I’ve never heard anything particularly good about those nor had any inclination to make time to read them myself…but I imagine if even those had had a lasting impact I’d’ve known about it by now. All told, as a “4/$1” “clearance” issue at a Half-Price Books…this was certainly worth my expense and time to read. It also has re-ignited my interest in tracking down the entire story to actually read…especially since it’s “only” 12 annuals plus the two-issue bookend mini. 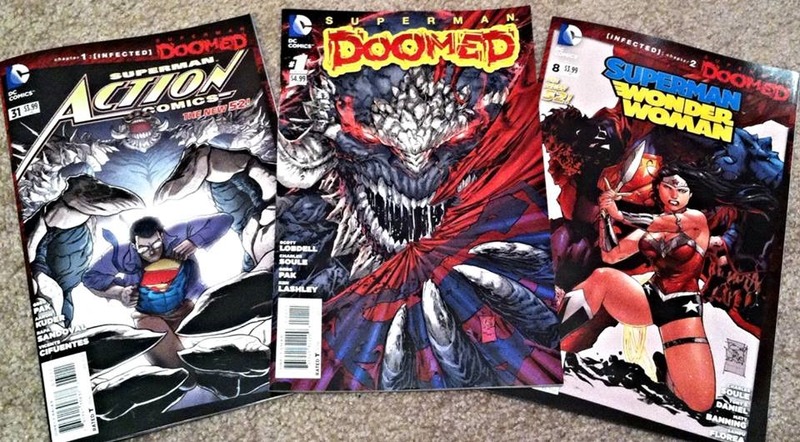 While I am certainly guilty of “enabling” or such in this case by buying along, the current crossover/”mini-event” Superman: Doomed makes for a bit of “case study” for why I will probably avoid the Futures End stuff and other future “mini events” or such from DC (to say nothing of Marvel‘s pricing, variants, and events). 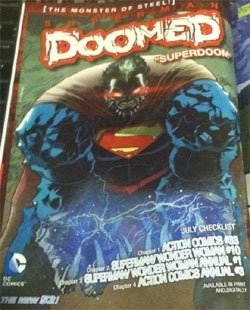 I initially allowed myself to be sucked into Doomed because firstly, it’s Superman; secondly, Doomsday (even though I really do NOT like the revised visual of the character); thirdly, an ad/checklist indicated 4 chapters, so I figured why not? Only 4 issues…sure. What I had not realized was that this was a 4-month, several-title saga or I would have simply awaited the collected volume…get the whole story in one book, all at once, in one place, no variants, cheaper than the singles, etc. As far into things as I’ve gotten, I intend to finish this one out, and then I will be far more hesitant with any future such stories. So far this has been a mix of pricing. As of this typing, we have 12 chapters. 1 was $2.99, 8 were $3.99, and 3 were $4.99…round the penny up on the cover prices and we’re at $42 so far. An ad in the latest issue gives an August checklist showing there are 3 more chapters, and unless I’m completely “off,” that’s 1 each at $2.99, $3.99, and $4.99. Meaning the $17ish story I thought I was getting into has become a $54 investment for 15 issues. (I paid about $55 for my Death and Return of Superman Omnibus that has about 40 issues’ content). And if I were to hazard a guess, I would guess that the hardback will be $29.99 to $34.99 cover price. I no longer pay the attention to “late books” that I used to…probably because I’ve been primarily sticking to Valiant and TMNT comics, and those have been coming out in the months they’re supposed to. I’ve not particularly paid attention to which week of the month, so if there’s been a bit of slidage I’m not particularly conscious of it. That said, it’s long been frustrating–if only passively so–the way books seem to “cluster,” rather than be more spread out. Valiant would seem to skip a week or two and then have multiple books out the same week…and I think the last couple months, both the main TMNT book and the Animated Adventures have been out in the same week rather than spaced out. Maybe they have different audiences, but there are some people (like me) who buy both, so instead of spreading the cost through the month, when they both show up the same week, I’m out $8 instead of only $4 that week. I noted my issue with this when Doomed STARTED, and the issue came up again a couple weeks ago with a $14 3-issue cluster that EASILY could have been spread out–and should have, as both of the $5 annuals were on a July checklist, not August. (In fact, 3 out of the 5 Wednesdays in July had NO new chapter! 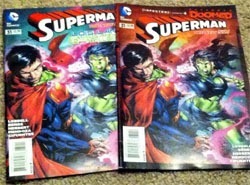 Superman/Wonder Woman #10 hit July 9th, and there was nothing July 16th, 23rd, or 30th). That $54 mentioned above actually translates to $62ish for me, as I wound up re-purchasing two issues. 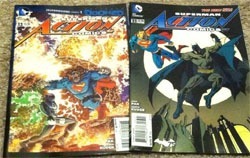 I didn’t even KNOW there were variants, and thus WOUND UP WITH variants for Superman #31 and Action Comics #32. Since this story has a trade dress and numbering, I sorta want all my single issues to look like they belong together, PARTICULARLY with the added expense and hassle OF buying this as single issues. The other week, I actually had to go to TWO shops just to get the NON-variant edition of Action Comics #34, as there were several variants left but the ‘regular’ trade-dress cover was sold out (and I got to the first shop maybe 2 hours after they opened?). It’s one thing to have a variant as an actual SPECIAL thing…and on “key” issues (like a #1 or anniversary or such), and on very FEW titles. But when they’re so frequent and common and such that it’s the VARIANT that’s left and the REGULAR issue that sells out, it’s just a little ridiculous. (and it’s not like I’m grousing that a 1st print sold out before a 2nd print or any such). I’m not going to blame the shop on the earlier issues: there was only the one cover there, the covers were not MARKED as variant (by the publisher), so I had no reason to suspect they were (perhaps I SHOULD have suspected due to how MANY variants are constantly being pumped out…but that’s another topic for another post). Of course, I wised up thanks to those, hence leaving my usual shop with one less otherwise-in-the-bag sale and went to another shop in seeking the regular edition. So, a few more issues to complete this story that I’ve gotten this far into…and I’m done. Again. There are plenty of “classic” stories I’ve yet to read, many I’ll enjoy re-reading, and given my enjoyment of bargain bin hauls…I don’t need the hassle of things like I’ve experienced with Doomed.